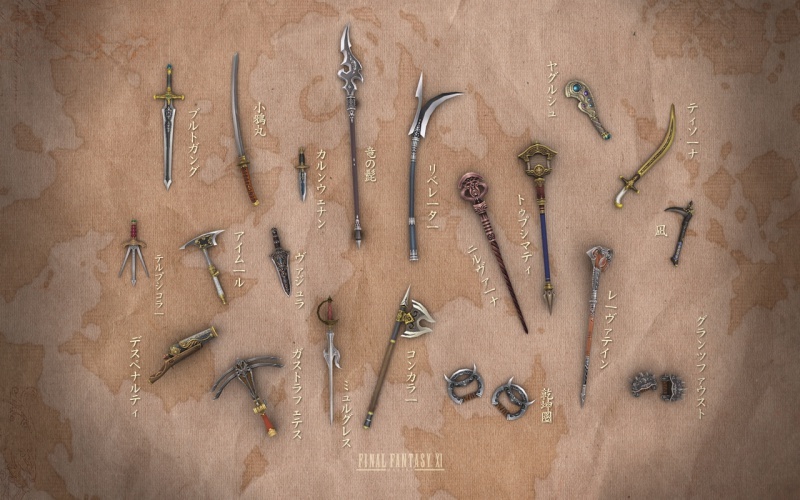 Mythic Weapons, also known as "The Myriad Arms of Balrahn" are twenty weapons (one for every job except Geomancer and Rune Fencer) obtained from Zeni Notorious Monsters. This page will show you where to acquire and what is required to upgrade each weapon. After obtaining your Mythic Weapon, they can be to their level 99 variants with Magian Mog CJ. To start a trial, trade your item to the proper Magian Moogle to start the corresponding trial. If you are upgrading to the next tier of trials, you need to trade the item TWICE (once to finish the current trial then once to start the next trial). You can type !trial at any time to check your progress in any custom trials on the server. You may only have one Mythic Weapon Trial active any one item at a time. Relic Weapon Trials do not count against this. When you take up a Magian Trial, you must perform a specific task a certain number of times in order to complete it. Each trial has specific conditions that must be met before it can be completed. See the flow chart below for what NM's or item is required to upgrade to the next level. Trials involve defeating a number of Notorious Monsters with the item equipped or trading Tanzanite Jewels to Magian Mog CJ. When trading the Tanzanite Jewels to Magian Mog CJ, you must trade the jewels first, then the weapon that you are upgrading for the trial. You will not receive credit for trials that involve killing monsters if the monster is defeated while you are out of experience points range. You will receive credit if you are K.O.ed. The weapon must be equipped in order to receive credit. Weapons that are dual wielded in the off-hand will still receive credit for kills. Once a trial has been completed, trade the item to the Magian Moogle to receive the upgraded weapon. In order to progress to the next level there is a pool of Notorious Monsters you can choose from in order to advance. You can choose to kill any of them, the only requirement is that you kill a total of nine from the appropriate tier. For example if you wanted to upgrade your Vajra, you could kill Brass Borer six times, Velionis twice, and Dextrose once. You will have sucessfully completed this stage of your Vajra upgrade since the total number of monsters defeated has reached nine. This page was last edited on 5 July 2018, at 06:36.